Feeling vain? The latest update to photo sharing app Instagram, version 3.5, brings with it a new feature called “Photos of You,” a repository for all pictures taken with your shining, happy face in them. Facebook users will instantly recognize Photos of You as a simple tagging system. The next time you upload a photo to the social network, you’ll notice a new button the reads Add People. Just tap it, and tag yourself or others in your shot just like you would on Facebook. Older pictures won’t be tagged automatically, but you can go through them individually to label you and your friends. Anything you tag of yourself will appear in your own Photos of You section; photos of your friends will appear in their sections. You can even tag brands like Taco Bell and Adidas if you’re the type who doesn’t mind giving advertisers an upper hand. My only complaint about Instagram 3.5 and the new photo tagging option is that you can only tag your own pictures. (You can, at least, untag yourself in others’ photos.) If your friend has a really good shot of you that you’d like to appear in your Pictures of Me section, you’ll need to ask them to tag it for you. There’s no facial recognition feature available to automate the work, though given that Instagram is owned by Facebook, that functionality may be in the works. Instagram account holders will have until May 16 to get acquainted with the new feature before Photos of You automatically appears on your profile. You can use the time to tag your own pictures and make sure everything looks good before the public gets a chance to see. Or, if you’re the private type, you can use the time to change your security settings so your friends’ pictures of you will only appear there with your approval. 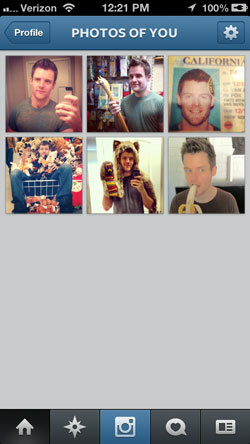 To gain access to the narcissistic new feature, all you need to do is update your Instagram app. The latest version 3.5 is currently available through both Google Play (Android) and iTunes (Apple).